Designed to evoke a sense of understated elegance, this collection from Kingston Brass exquisitely enhances a variety of decor styles. Especially suited for contemporary interiors with its sharp, modern angles, the 5-Piece Bathroom Accessory Set includes 24-inch and 18-inch towel bars, a towel ring, robe hook and tissue holder in a bright, polished chrome finish. Easy to install with included hardware, this set also features a concealed mounting design that creates a seamless look with no visible hardware, ensuring clean style throughout your bathroom. 5-Piece Bathroom Accessory Set in Polished Chrome Designed to evoke a sense of understated elegance, this collection from Kingston Brass exquisitely enhances a variety of decor styles. Especially suited for contemporary interiors with its sharp, modern angles, the 5-Piece Bathroom Accessory Set includes 24-inch and 18-inch towel bars, a towel ring, robe hook and tissue holder in a bright, polished chrome finish. 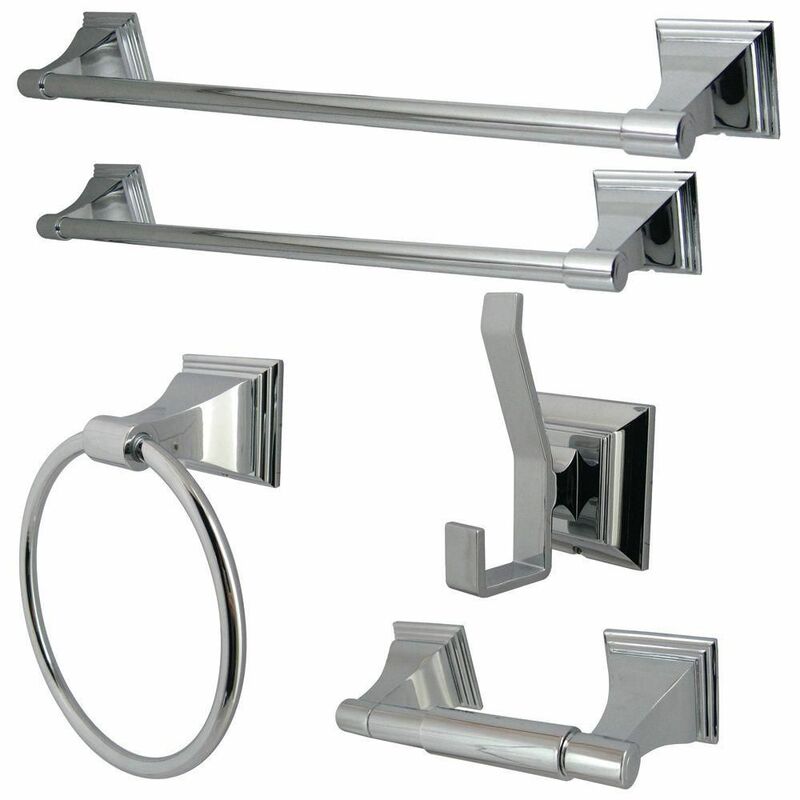 Easy to install with included hardware, this set also features a concealed mounting design that creates a seamless look with no visible hardware, ensuring clean style throughout your bathroom. 5-Piece Bathroom Accessory Set in Polished Chrome is rated 4.3 out of 5 by 18. Rated 5 out of 5 by Ed from Was exactly what we wanted! Easy install, looks great... Was exactly what we wanted! Easy install, looks great in the bathrom. Rated 5 out of 5 by Joann from Great value... very nice. Great value... very nice. Rated 4 out of 5 by Alain from Good product Bought it online. Received product on time is exactly as described. Rated 5 out of 5 by oksana333 from Great buy! I bought a couple of sets for a custom home we are building.....and I am glad I did. You definitely get your money's worth with this set, especially if you need to do more than one bathroom. It is attractive and something I would definitely recommend.